Chattanooga native and Baylor graduate Brooke Pancake stands on the Walnut Street Bridge in downtown Chattanooga. Pancake will be playing golf on the LPGA tour this year. 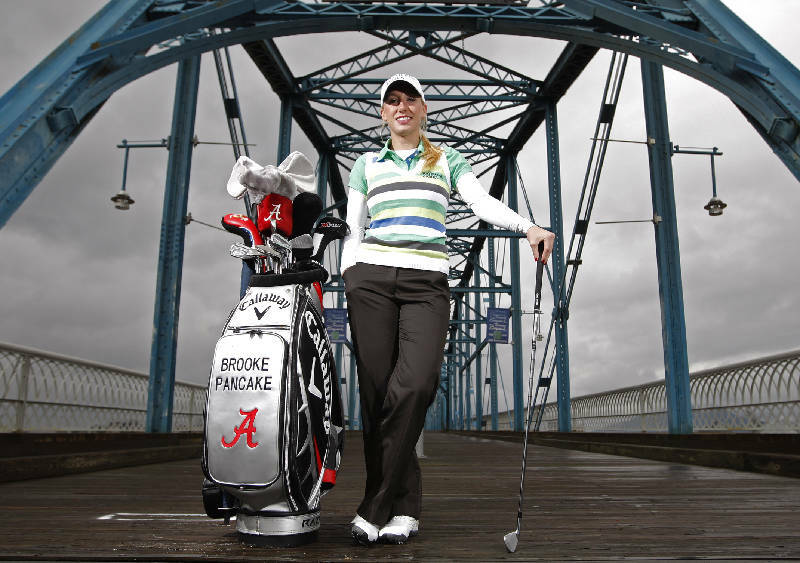 Brooke Pancake's professional golf career celebrates its first anniversary this week when the former Baylor School star plays in her second straight Women's U.S. Open. It's the same tournament where Pancake, an All-American and academic All-American at the University of Alabama, made her professional debut last year. She qualified for the LPGA Tour and has been competing in tournaments across the globe including Australia, Singapore and Thailand this season. "It has been a lot of transition and learning the lifestyle of the LPGA Tour player," Pancake said on her way to practice Wednesday morning. "It's been a learning experience. Pancake heads into the U.S. Women's Open at Sebonack Golf Club in Southhampton, N.Y., following her best finish as a professional. Pancake tied for 13th place on Sunday after shooting a 7-under 206 and earned more than $32,200 for her performance. "It was refreshing, and it definitely was great knowing that some hard work has paid off," Pancake said. "My short game really saved me, and that's a big building step for this week." The entire year has been a building process for Pancake who is adjusting to life on tour and enduring the struggles many other rookies face. The travel, more difficult course set-ups, media and sponsor obligations were subjects she rarely had to tackle on her own at Alabama. "I've made plenty of rookie mistakes, and it can get pretty lonely," Pancake said. "The travel gets pretty tough because every week you're traveling and doing it on your own. It's still our job and we're on a business trip, but it's hard too when you're not playing well." The one check is the bulk of her earnings from competing on LPGA Tour. She's earned a little more than $40,000 since opening the season in February at the Australian Open. She has also just qualified for the CME Group Titleholders Championship which is the season-ending championship. She made the cut in her first two tournaments of the year. Then missed the cut in seven consecutive tournaments before earning her first top-20 finish last Sunday in the Wal-Mart Northwest Arkansas Championship. "I kept working on things for the long-run, but I wasn't seeing immediate results," Pancake said. "It's hard to manage our mindset when you're not playing well. I wasn't taking [the work] to the tournament and the golf course, and I was getting in my own way." Pancake had been working with former Black Creek Club head professional Todd McKittrick until he took a similar job at Manchester Country Club in New Hampshire. She turned to fellow Baylor alum Harris English -- who won the FedEx St. Jude Classic on the PGA Tour earlier this month -- and has begun working with his swing instructor, Mike Taylor at Sea Island Golf Club. Her goal for this week is to take the momentum from last weekend and the work she's put in to the challenging USGA set-up this week on Long Island. She will begin her tournament today, starting at 2:31 p.m. on No. 10 in a group with Ha-Neui Kim of Korea and Dewi Claire Schreefel of the Netherlands. "This golf course is a beast," Pancake said. "It's really tough. It's also breath-taking, and the views are amazing. It's going to take all aspects of your game, and it's challenging when you have long clubs into the greens. You can hit really great shots and get unlucky bounces." Contact David Uchiyama at duchiyama@timesfreepress.com or at 423-757-6484. Follow him on Twitter at twitter.com/UchiyamaCTFP.